I was working full-time as a customer service adviser and volunteering as an NHS patient befriender before SWAP. Nursing was always my preferred career and volunteering reassured me that nursing was my dream. I enjoyed the course very much and it has set me in good stead for preparation for uni. In the future, I look forward to completing the three years at UWS and continue with my aim of becoming a registered nurse. I am a wife and mother of three children, and I work for Quarriers as a support worker in a supported living house. I had been considering a career in nursing for a few years and the time was right for my family and myself to take on four years of studying. I have enjoyed the challenge of coming back to study after many years. The SWAP programme has provided the vital stepping stone I needed to achieve my goal. I am to qualify from UWS in three years and I am open to the direction my university degree will take me. I am an employment adviser for people with mental and physical health conditions. I had always planned to go back to education once my children had finished university and nursing was always my goal. The SWAP programme has prepared me for university and is a really good way back into education. I worked as a manager in a busy travel office for twelve years. As a mature student, a combination of real-life events and personal ambition has made me determined to become a nurse. The SWAP programme has equipped me with the skills and knowledge I need to go further in education. I enjoyed biology, chemistry and psychology. I am looking forward to learning a variety of different skills and putting them into practice. I am very excited about my future placements and discovering which direction my nursing qualification will take me. I’m Fiona and I’m 25 years old. My family is from Scotland but I was brought up in California. I moved to Scotland one year before I started the course. I have wanted to become a nurse since I was 10 years old. When I moved here, I wanted to return to education to study nursing. SWAP has been a really good experience to prepare for university. I would like to become a wound care or trauma nurse after graduating. Nursing was what I always wanted to do, but I left school without the grades required. After doing many jobs that I didn’t like, I found the SWAP course, which has opened the door for me. I was also inspired by having a bad hospital experience with a family member, which made me want to make a difference. The SWAP programme has perfectly prepared me for university. I am a mum of four children and before returning to study I was a care assistant in a dementia unit. I wanted to widen my knowledge and ultimately have a more active role in the care profession. The access programme was interesting and challenging and I am looking forward to completing my degree and working as a mental health nurse. I particularly want to advocate for people with mental health problems. I am a 44 year old mother of two who has mainly worked in the catering industry. SWAP was very enjoyable, although very intense! It was a very quick year that has prepared me for my future studies. My childhood ambition was to become a nurse, so I am looking forward to qualifying and progressing in my career. I am a qualified hairdresser; I worked in a salon for five years and was self employed for two years. I then applied for college as it is my dream to become a child nurse. It has been hard work and much effort was required during the access year, but it has been a fantastic year! Before starting college I was working as a carer in a nursing home. I wanted to progress in my career and SWAP was the next stage. The programme has been very good for me as I have been out of education for years. My confidence has grown greatly. My future aim is to work in children’s mental health when I graduate. Before I returned to education, I was working in a call centre, I wasn’t happy there and, as my son starts school this year, I thought it was a good time to pursue my dream of becoming a nurse. SWAP has been a great way to return to education and I look forward to becoming a successful nurse in the future. I am a support worker for the elderly, so before college I assisted people to live independent lives in their own homes, as well as looking after my child. I enjoyed my job and wanted to further my career, so I applied for SWAP. 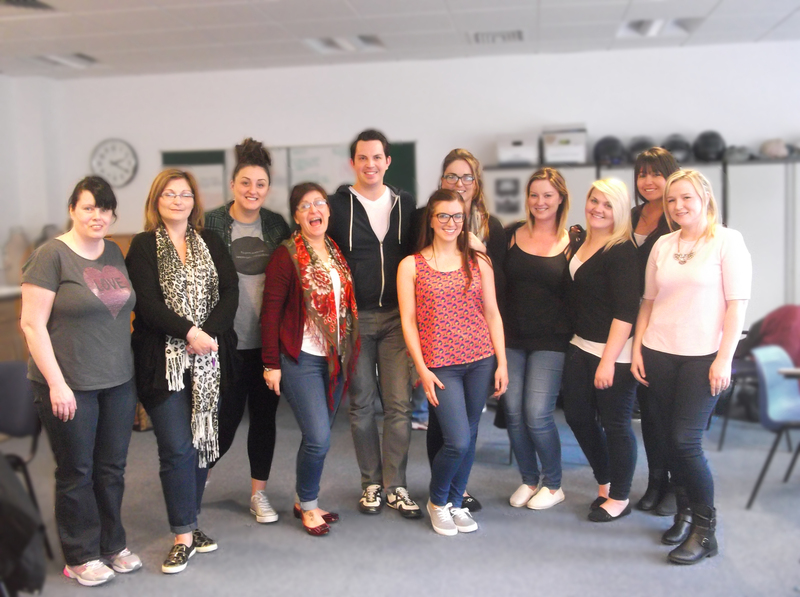 The course was fast-paced and hard work; however, I have loved being in education again. I am 30 years of age and it was a big decision for me to leave my job and return to education, living as a student on my own. My father became ill, and spending much time in hospitals made me realise I wanted to help people. 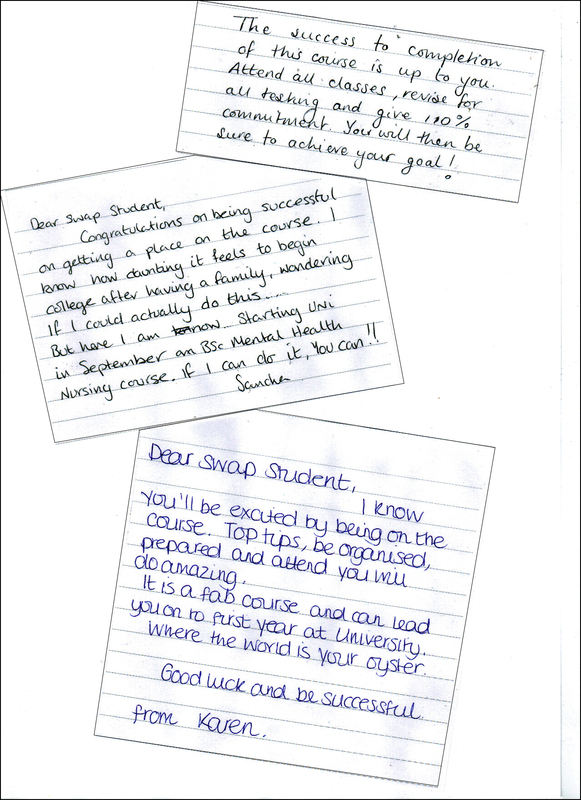 The SWAP programme has been beneficial and the lecturers were supportive. I hope to try many areas of adult nursing and would love to work in A&E or cosmetic surgery. I worked in travel before coming to college, and I am a mother of two children. I always had an interest in caring for others. I felt it was the right time to enrol in a SWAP programme as I was made redundant. It was, on reflection, the perfect opportunity for me to return to study. I thoroughly enjoyed the course, especially due to being in a class of mature students. I now plan to complete my HNC and apply for adult nursing or occupational therapy at uni next year. I am 28 years old and worked as a carer before SWAP. The experience made me want a career as a nurse. Access to nursing was the perfect route to study nursing. I loved this experience and have made friends for life. In the future I hope to find work as an A&E or cardio nurse. Before college, I was paid off from my job as a PA for Volvo and decided to make a big career change. I was pregnant as the time and started studying when my daughter was just 12 weeks old. In hindsight, being paid off was the catalyst I needed to find a job that I enjoy. 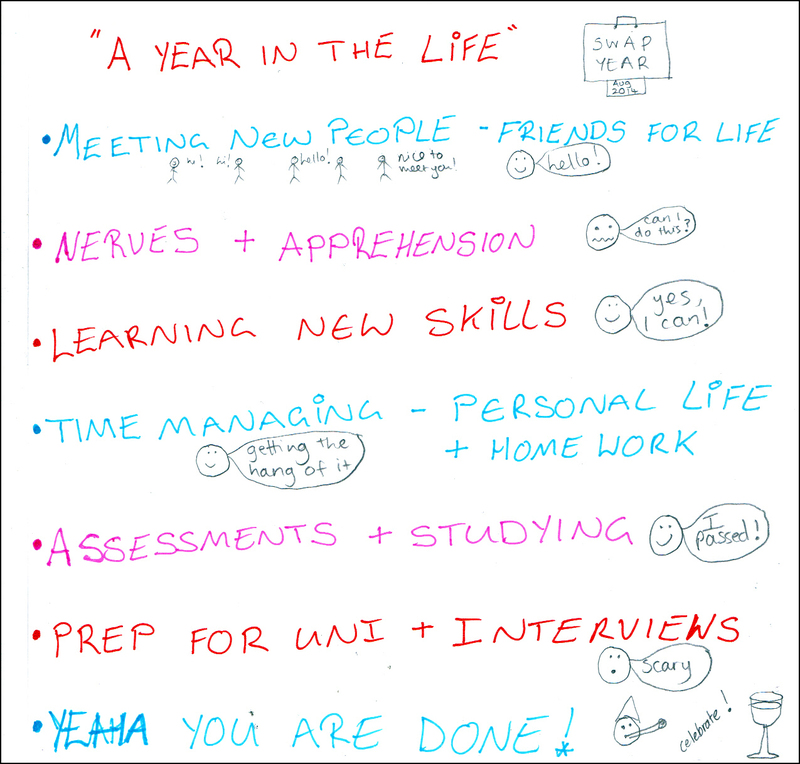 SWAP was a challenging year, but a huge help in terms of returning to study and learning how to cope with assessments. After completing my nursing degree, I would like to move abroad to find work. Before returning to education I had a full time job as an auxiliary nurse, where I had worked for seven years. I felt the timing was right and applied for the SWAP programme. SWAP is a great way to prepare individuals for university and in the future I aim to work hard at university, achieve my degree and find rewarding work as a mental health nurse.